Logic Smoke RY4 E-liquid is a mild tobacco flavor with a bit of caramel flavor mixed in for added enjoyment. This is an e-liquid for anyone, whether you typically enjoy tobacco flavors or not. 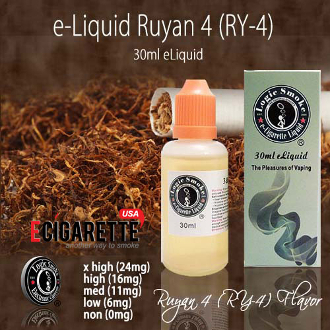 Pick up a bottle of our RY4 E-liquid from Logic Smoke and enjoy. The 30ml e liquid bottle is a convenient and economical size for purchasing in quantity. Fill your clearomizer or other e-liquid atomizing device directly from the bottle or use it to refill your smaller travel-size e-liquid bottles. You'll be ready and have liquid on-the-go at any time. Experiment and decide what is best for you. You'll truly enjoy the smooth taste of the Logic Smoke RY4 e-liquid. Happy vaping! !